Do you have the info you need to capitalize on the growth of the legal cannabis markets? 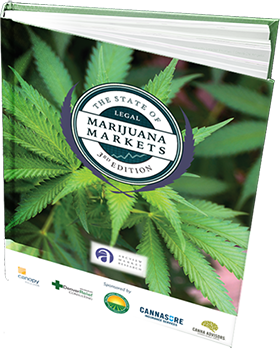 The State of Legal Marijuana Markets 3rd Edition is the definitive source for market sizes and high-level analysis of business trends in one of the fastest growing markets in the US. For the cost of one or two hours of a top expert’s time you get the benefit of hundreds of hours of research, hundreds of surveys of market participants, and in-depth interviews with the top business-people and policy changers, all distilled down into the most actionable high-level analysis and the most trusted market numbers. The report provides the high-level analysis needed for those looking to expand their business, makes investments, or raise capital. The ArcView Group believes that business is the most powerful platform for political change and that the development of a responsible, profitable, and politically-engaged legal cannabis industry will be the single biggest factor in hastening the day when not a single adult in the world is punished for this plant.